Sitting comfortably? Biohacker and Grindhouse Wetware member Ryan O'Shea has just posted a YouTube video of its Northstar LED implant procedure. Warning before you hit play: there's blood, quite a lot of it. And if, like us, you're a bit squeamish you'll probably look away. Or at least scrunch your face up. The video shows a Northstar V1 module being inserted into a Grindhouse collective member's hand. 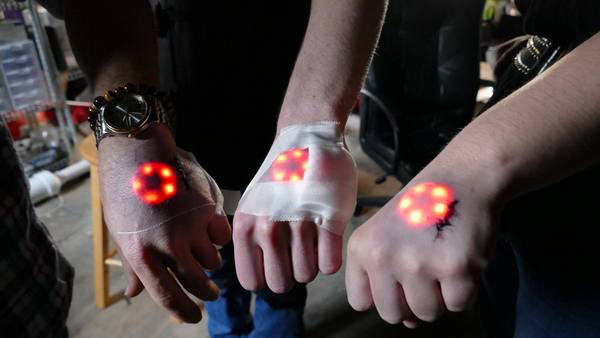 The coin-sized device has five red LEDs which light up for ten seconds under the skin and is activated by a magnet. It can also be used to send Bluetooth commands to your phone or smart home. Very cyborg chic. The whole procedure looks pretty quick, to be honest, and onlookers can be heard saying that the Northstar device looks like it fits. It's very obvious that there's something under the skin but hey, that's the point - it can be used to highlight tattoos, for instance. Back in 2015, we spoke to biohacker Tim Cannon who has two RFID chip implants, one in each hand, as well as a magnet in one of his fingertips. "I want to give humanity the capability to be what it claims it wants to be which are these curious, benevolent researchers and explorers," he said. "I definitely don't think that the body we're riding in allows for that in any way." If you want to see more gory footage, O'Shea is posting an extended cut to his official Facebook page in the near future so look out for that. There's a teaser of a forearm procedure to tickle your fancy. The YouTube update also features a plug for Grindhouse Wetware's Future Grind podcast which includes interviews with Tim Cannon and US presidential candidate Zoltan Istvan and is worth checking out. More importantly, O'Shea says that lots of people have been in touch asking when they can get the Northstar tech themselves and that this is coming soon.